When Starfish Ministries took over the orphanage in Haiti in January, 1998, Nodi was already there. He was 11 years old when I first met him and I was immediately drawn to him. Nodi was a boy who was near death when his uncle found him at his blind grandmother’s home. She was not able to care for him so he begged for food in order to feed them both. When his uncle found Nodi so sick he brought him to the orphanage in hopes of finding a home that would care for him. Over the years Nodi was often sick. When he was 13 years old he was diagnosed with Sickle Cell Anemia. Haitian doctors told us that this disease would take his life by the time Nodi was 20 years old. When he passed 20 they changed his life expectancy to 25 and then to 30. Nodi is now 28 years old and still doing well although he does have bouts of this sickness from time to time. I’m on my way home again after spending the last two weeks in Haiti. It was another great trip as we saw God at work in many ways. Vince Buys and Brent Ahrens were our well drilling team on this trip. I really appreciate these guys, going out early each morning and donating their time to serve the Lord in this way. 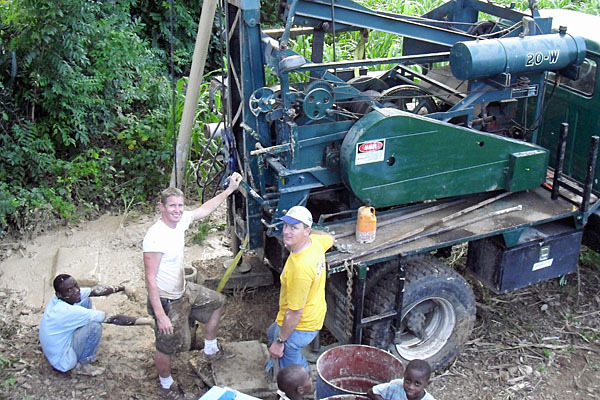 We look forward to providing good, pure water in each of the villages that we minister in. We are seeing such positive results of the wells that are currently producing – there is less sickness and also the people are realizing that this is a gift from God and it softens hearts for the gospel.